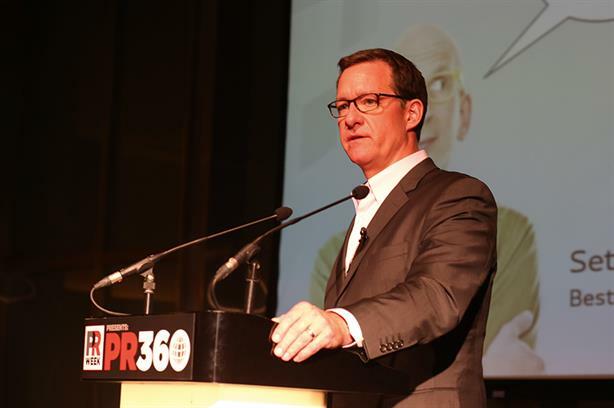 The tide of technological development in digital and social media has swept marketing comms straight into the maw of the PR industry, according to speakers at PRWeek's PR Summit at PR360 in London last month. Kelly Walsh and James Warren, chief strategy officer and head of digital respectively at MSLGroup, gave the keynote presentation in which they argued that to all intents and ­purposes marketing comms and PR are the same thing these days. "If one analyses what a brand or ­organisation needs to excel at to deliver marketing success in a digital age, the result is a long list of PR outputs," said Warren. "In the new communications agenda, everything is PR," he added. They explained what the new world of comms looks like and made the case for the comms ­director to direct all the other marketing disciplines, to be "the nucleus around which all other functions are organised". "We ­believe that the CMO of tom­orrow won’t come from an ad or media background, but from c­omms," said Walsh. Content A hard-working website allied to the sustained production of informative, editorially oriented long-form content within it, and a widely relevant always-on digital ecosystem that feeds (and feeds from) the site. Influence The identification of suitable ­influencers and the associated generation (and promotion) of advocacy. Search Organic search optimisation (achieved through relevant, well-written content with ­authoritative links). Real-time engagement Using real people to ­respond to situations immediately and ­authentically. Leave a void and someone else will fill it, define it and control it. Creativity From insight that inspires a great creative idea to the creative use of technology to deliver that idea in the form of content, it remains the single most important component of ­successful engagement. Consistency The idea that we consume ­information in silos is at best naïve and at worst dangerous. If the information is out there it will be found and shared. Success today lies in connected, multi-stakeholder communication that maintains a consistent narrative thread across audiences and channels. Social Social activation and online community management are integral to success. Authenticity An ability to embed seamlessly complex specialist messaging (i.e. sustainability) into a broader corporate or consumer narrative. Employee stories that start from the inside out Employees are becoming the ultimate reputation makers or breakers in a world where organisations increasingly sell experiences over products and where truth is more accessible and shareable – particularly by those on the inside. Employees are connected to ten times more people than brands, providing greater reach, speed and ­influence. Partnership Establishing trust (at an all-time low, while cynicism is at an all-time high) and preference through fact-based third party ­accreditation and partnerships creates permission to purchase, consume and experience – with less guilt or greater reward. Customer service A game changer – practically limitless choice has reset the bar and product differentiation is diminishing. The ability to ­establish and maintain positive relationships builds ­a reservoir of goodwill. If we don’t like what we get, we’ll go somewhere else – and let everyone know. Paid Paid advertising is still commanding a large share of the marketing budgets and ­attention. It has the ability to tell powerful stories that connect on an emotional level. The optimal tweet is 70 to 90 characters ­before people stop reading, said Jeff Kuhlman, global comms chief of Nissan, in his presentation on PR in 2020. Reflecting on the accelerating rate of declining attention spans, he said: "As the world continues to demand more instantaneous immediacy, this will mean major changes in how consumers all over the planet demand information." He teased his audience on their diminished ­ability to focus with the observation: "Within 60 seconds of my introduction, some of you settled in with a tell-tale dip of the head, illuminated by a certain dim light. A kind of digital candle light, scattered throughout the audience. The iPhones had come out." To illustrate his point he gave four micro speeches rather than one speech. The first concerned growth in audiences. He quoted a report by Ernst & Young which estimates that over the next two decades, the global middle class will expand by three billion. The second speech argued that we will be living in a hyper-connected world – 44 per cent of new purchases are the result of positive word of mouth but they will come from millennials who hate spin. "Millennials are the greatest challenge to our industry," he said. His third speech argued that comms will have to be remarkable to cut through. "In five years we will be able to reach nearly ­everyone alive. But we have to ask whether what we are sharing is ­memorable." Lastly he reminded his audience that the fundamentals still ­prevail. Storytelling will still be at the heart of comms and the ­industry will need to renew its focus on ­outputs not ­outcomes if it is to stay relevant. The fundamentals of communication have hardly changed since the first cave drawings 40,000 years ago, argued Dan Drage, head of ­strategy at digital content company 72Point. So if you want to tell stories successfully you could do worse than ape the approach used by early human beings. "Only stories worth sharing are worth telling," he said in a masterclass on ­creativity and branding. "So get to the point, ­identify your audience and then locate them." He said that the latest thinking about cave drawings is that they were not, as previously ­assumed, religious symbols to appease the gods but narratives left for later occupants of the cave. These narratives were simple, clear, targeted and segmented their audience, he argued. In an hilarious interactive session involving mini-exercises taking just a couple of minutes, he asked a room full of weary PR professionals to represent their brand story as a cave drawing – which delegates did with varying degrees of success. The exercise dramatised the importance of ­having absolute clarity about what your story or narrative is and brevity in expressing it. In Robert Altman’s film The Player, the main protagonist movie producer asked for pitches to be given to him in "25 words or fewer". He might well have added draw it so a cave man can understand it. The future of the PR industry lies in content, was the unanimous feeling among speakers at the PR summit. But Jason Schlossberg, co-founder and chief creative officer at US agency Kwittken, took the argument one step further. If PR is going to be about content in an ­increasingly visual age, then there is a compelling case for PR professionals to start thinking and ­acting more like designers, he argued. "In the world of brand communications everything connects, but it is the quality of those connections that determines good communications from bad communications...design thinking is a proven process for problem solving and innovation that can make PR output more authentic and more credible," he told the conference. He said that the first lesson from design is to "start from a human-centred approach looking at the brand and understanding the role it plays in communications. Well-designed products tell a story. Poorly designed products also tell a story – often about the organisations and individuals who designed them," he warned. A good design problem emerges from sound ­research and insights. The better the problem, the more constraining it is. "Creativity doesn’t just love constraints; it thrives under them," he said. Journalism is in ­danger of "losing ­control" in the Wild West-style era of the "citizen publisher", ­according to the BBC News channel’s ­recently departed morning editor Simon Waldman. He told a panel that journalists and PRs are both "thrashing about" trying to come to terms with the new era, heralded by the rapid rise of social media. "We’ve got to the ­generation of citizen ­publisher," said Waldman. "It’s like the Wild West out there. ­Anyone can publish ­anything." He added: "Bluntly, we are in danger of losing control. There’s such an enormous potential for ­anybody to get their message across on such a plethora of platforms and outlets that the days when the PR fed either all journalists or selected journalists the story, and the journalist processed, editorialised it, and put it out, has gone." Waldman, who left the BBC in March, described the relationship between journalists and PRs as "symbiotic-parasitic", and "love-hate", but stressed that "each side absolutely needs the other" and the relationship is "still very important". Waldman gave the example of exit poll results for a French election that were tweeted by one BBC journalist before the polls had closed and the ­embargo was lifted. "It could have put us in prison," he said. He also raised concerns that the younger generation "don’t seem to care where news comes from". "They just want to get the content as quickly as possible."